I haven’t read this title since its first arc, but I love the premise that Sam Alexander is a young kid who stumbles into gaining powers and has to deal with the aftermath wreckage. I was also drawn to this title because of Sam’s struggle to adjust to life without his dad around. As far as he knows at the beginning of the first arc, his dad simply abandoned their family. In this one-shot, Nova hangs out with other teens who have likewise gone through their fair share of feeling alienated and alone: the students of the Jean Grey School! The issue begins with Nova visiting the grave of his taciturn friend, Uatu the Watcher. Nova’s been expelled from school, and shares that his goal is to graduate high school. He convinces the principal to let him return to school. Upon entering the school, he realizes that it’s Halloween. He gets a text inviting him to hang out with the Jean Grey School students. 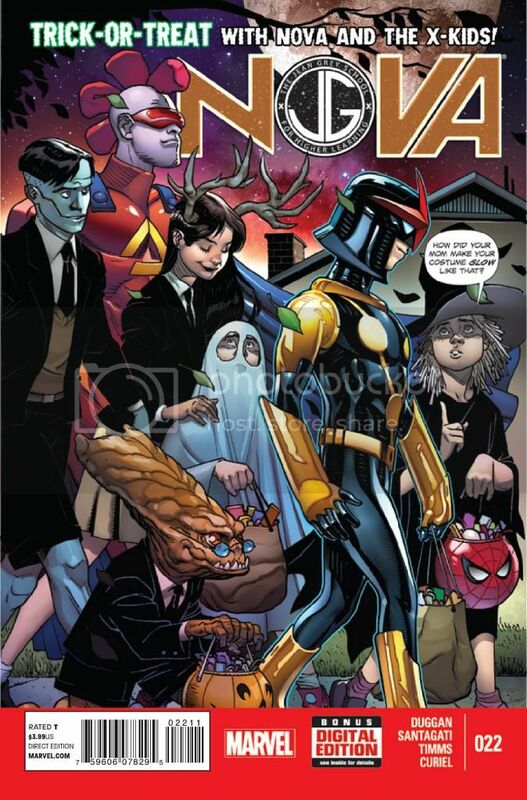 Gerry Duggan writes good-natured, humorous dialogue, such as when Armor reveals that she thought she was texting Speedball, and when Nova learns that Nature Girl’s antlers aren’t a costume. It’s refreshing to see Nova hanging out with others of his age cohort — Genesis, Kid Gladiator, Armor, Nature Girl — instead of always being the youngest like he is in “New Warriors.” The issue ends with a phone call from Steve Rogers, and Sam flies off to his next mission. The art by Federico Santagati and colors by David Curiel are beautiful throughout. I like the backgrounds of outer space on the first page, and the bright fuchsia tshirt worn by the girl who Sam obviously wants to get to know better. I hope Duggan lets JGS students cameo more often in “Nova.” Sam remarks to Armor here, “It was nice to just hang, and not have it be a life-or-death emergency.” It’s fun for readers, too, to receive a simple one-shot story that isn’t tied to any larger event or crisis. This is a charming but brief issue that can be enjoyed by readers of all ages.